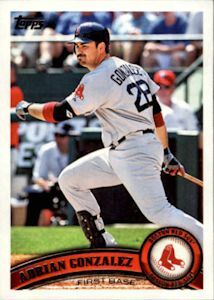 ON THIS DATE (May 16, 2011) ... Fenway Park was not even half full when Adrian Gonzalez walked to the plate in the bottom of the ninth inning. Raw, rainy weather and a six-run deficit against the Orioles had sent most of the fans scurrying for the streets. They missed witnessing one of the victories that could come to define the season. Gonzalez drove a two-run double off the wall in left field that gave the Red Sox a stunning 8-7 victory on a night when all seemed lost. Gonzalez finished 3 for 5 with three RBIs. With the Sox down by a run, Jacoby Ellsbury drew a walk off Kevin Gregg. The Baltimore closer then got ahead of struggling Dustin Pedroia 0-and-2. But in typical fashion, Pedroia would not give in and walked on the ninth pitch of the at-bat. Pedroia, running hard all the way, scored before the Orioles could get the ball to the plate. The Sox had fallen behind, 6-0. After five shutout innings by Orioles starter Chris Tillman, the Sox sent 10 batters to the plate in the sixth and scored five runs against three relievers. Facing Mike Gonzalez, J.D. Drew singled and took second when the ball skipped past Luke Scott in left. Jed Lowrie followed with an RBI double. After Carl Crawford reached on an error, Jason Varitek lined an RBI single to right. With two outs and Jeremy Accardo pitching, Gonzalez singled in a run. Kevin Youkilis's two-run double off the Monster proved a huge blow in a five-run, five-hit eruption in the sixth inning that helped the Red Sox erase nearly all of a 6-0 deficit. The Sox scored another run in the seventh off Jim Johnson when Lowrie tripled to center and Varitek had another RBI single. That drew them close enough to make quick work of Baltimore in the ninth.